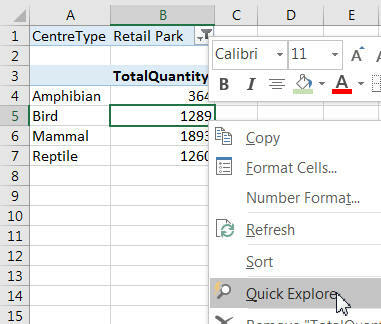 This part of the tutorial shows two ways in which you can analyse a particular number further: by drilling-down to show the underlying numbers, or by using Quick Explore to break it down by the values in a particular dimension. If you're wondering why you haven't seen Quick Explore before, it only shows up when you have a pivot table based on certain data sources (of which a tabular model is one). We want to know the break-up of these 364 sales. You can right-click and choose this menu option, but it's much more fun just to double-click on the cell. The First 1000 rows title is misleading, as there are actually under 300 rows of data for this figure. 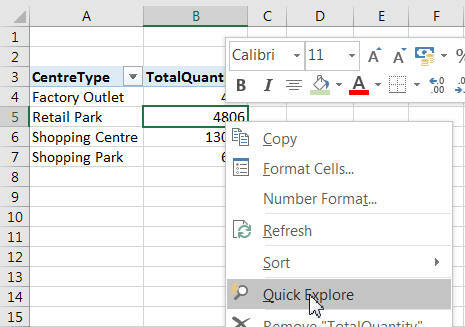 This worksheet won't be dynamically updated when you refresh the underlying pivot table. For normal pivot tables drill-down works well, but for pivot tables based on tabular models the results aren't as easy to interpret. The pivot table is already showing quantity broken down by centre type. 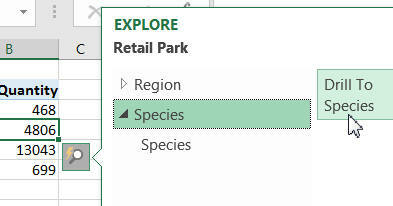 The other dimensions to this pivot table not currently displayed are Region and Species, so you can explore by these. Here we're exploring the figure 4806. You can choose to explore in this case either by region or by species. 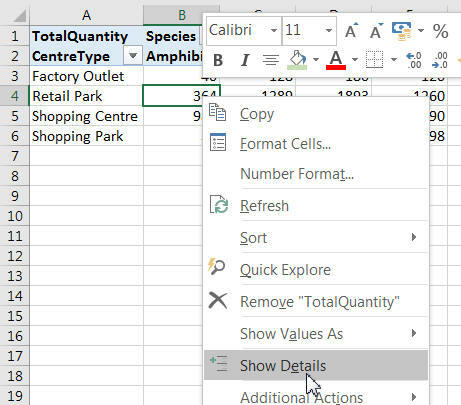 Since we clicked on a Retail Park cell, Excel displays this as the chosen centre type in the filter section of the pivot table. Right-click on the cell whose contents you want to break down. Despite this, however, we'll choose to break this figure down by region. The figures shown sum to the total birds figure above of 1289. Confused? I usually am. The idea's good, but the implementation takes a bit of getting used to! We're getting near the end of this (long) tutorial now, but there's one important topic I haven't yet covered: slicers. Time to remedy that!